I went into labor with my son seven weeks early. My water broke before they could stop it, and that was that – he had to come out. Looking back at it now, it’s terrifying to realize how early that is, but at the time the doctors were only telling me how big and strong and healthy he was, so I was tense and excited to meet my baby but not scared. Unfortunately things don’t always go the way that we think they will, and one emergency c-section later I was being moved to recovery. I hadn’t even seen my son – they whisked him off to the NICU without a word – but after I stopped shaking enough to think, my husband showed me the few pictures he had snapped as the doctors were intubating him. Once they had him settled, my husband went down to the NICU and took some more pictures for me, but that was all I had: I couldn’t get out of bed, and my son certainly couldn’t leave the NICU. The next day I was allowed to begin walking, my IV stand in tow, and after a few careful trials the nurses sent me off to the NICU to see my baby for the first time. He was big for a preemie, five pounds, with a head full of downy brown hair, but I couldn’t hold back tears as I listened to the explanations for each tiny tube and wire attached to my baby. 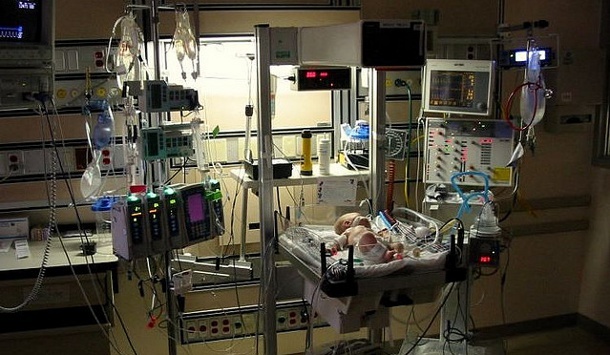 Despite the oxygen tubes in his nose, his tiny chest sucked in as his underdeveloped lungs struggled with the overwhelming burden of inhaling and exhaling, and he lay in his little incubator – for the most part – very still. Over the next week, visits to the NICU lost that sharp edge of pain and became a little more routine. I recovered somewhat from my surgery and was discharged; my son began breathing easier, and there was even talk of removing the little tube that fed milk straight down into his stomach so he could try nursing. I visited him every day, for as long as I could, and our little curtained-off section of the NICU began to grow familiar. One day, after he was moved from his incubator to an open-topped bassinet, I noticed that the blanket that padded the bottom of his bed looked handmade. Pushing aside some wires and peeling back the flannel receiving blanket, I saw that my initial guess had been right: softening the bottom of the little plastic bassinet was a handmade quilt. I looked up, and suddenly I saw something I hadn’t really noticed before. Every single incubator, bed, and isolette was touched by the hands of crafters. Little handmade beanies covered the heads of some of the babies. Quilts and afghans softened beds up and down the row. Even lacy afghans found a home covering incubators to filter the light. I can’t describe the feeling that I had as I realized that the entire NICU was filled with tokens of love and support from crocheters, knitters, and quilters that I had never met. I didn’t know a single person who had made even one of the hats or blankets there, but I knew many who had sent blankets and hats to other hospitals, for other babies, and I felt in a bizarre way that the NICU was full of friends. I know it isn’t logical, but seeing that made it easier for me to leave my baby when it was time to go home – I wasn’t leaving him alone, I was leaving him with friends. My son was able to leave the hospital after three weeks in the NICU and is now a strong, healthy, happy child. Even though it has been years now, thinking of the love that I felt from so many people during one of the most difficult times of my life still brings tears to my eyes. I want to take this opportunity to say thank you to everyone who has ever made anything to donate to a NICU or hospital: the odds aren’t great that your blanket or hat was one that I saw, but I want you to know what a difference it made to me to see them there. Thank you. I appreciate it. Crochey Day is a mom and a crocheter who loves to find new patterns on the internet. She collects links to free crochet patterns in the Crochet Day to Day directory! Article © Crochey Day. All rights reserved. how these gifts helped the families. We very seldom receive feedback because these are given anonymously. These are certainly gifts of love to families we don’t even know. I have experienced your side, too, since I am a grandmother of a 5 year old former NICU baby. Again, thank you for sharing your experiences. This was such a great article to read. I work with a Project Linus group (among others) and have no first-hand experience with recipients. I do it because it brings me peace and happiness while I’m crocheting borders or tying knots in fringe. I find it hard to put myself in the place of the recipient to really understand how that little piece of fleece can mean something to a stranger. Now I get it. Thank you for sharing your story with us. Thank you so much for sharing your story. I am the grandma of a NICU baby that we lost 4 years ago. I remember when the hospital brought the handmade crocheted blanket and gave it to my daughter for her daughter. She still has that blanket and cherishes it because she says it reminds her all the time that there are people out there that we don’t even know that do selfless acts just for strangers. I myself am a crocheter and would love to get involved in a program like this. At the current time I am crocheting baby afghans for a ministry that houses girls and women who are putting their babies up for adoption. They are going to be sending an afghan with every adopted baby with a tag reminding them of where they came from and that someone somewhere was thinking of them even before they were brought into this world. While I sit reading your story, I cry not only for your words.but for my memories as well. My twins were NICU babies as well they were born 15 weeks early. In case you are trying to do the math that would be second trimester weighing in at 1.5 lbs each. (They stayed at hotel ‘Motown for over 100 days ) They were in incubators for several weeks and their first little cries weren’t heard for a month. When I was rolled into the room I saw that their little isolates were each covered with a delicate soft lacy afghan. Nothing could be placed in the isolates for fear of contamination but on them was a different story. The ladies who made these found a way to bring comfort when no words would do. I am deeply touched by their gift and want to reinforce the need to create more blankets and isolate covers to help comfort us mother who need an unspoken hug. Our NICU has an alumni picnic which I bring as many blankets I can make with two healthy 4 year old will allow me to. I knit, crochet, create so much however those two blankets hold a place of high honor. Thank you for sharing your story I hope you don’t mind that I have shared mine. For several yrs I sewed with Threads of Love, a group of sewers, knitters, crocheters who give of their time and love for these babies and their families. About three yrs ago I had made some flannel blankets and they were delivered to the hospital. In Jan ’11 my last grandson was born, and he inhaled fluids during delivery. He spent several days in NICU, and on the 3rd day my daughter and I went to visit and feed the baby. My daughter told me I could pick him up and feed him; and I was totally blown away to find him wrapped in one of the blankets I had made. Because of the fabric and the way I had used it to make the blanket, it was undoubtedly the one I had made. God couldn’t have sent me a clearer message that I was doing what he would have to me do, sewing for these babies. I didn’t realize three yrs prior I was sewing for my own grandson and the many babies who had used the blanket before our precious little one came along! Yes! And not just the nicu. My most prized possesion is a tiny blue checked pillow given to me when I left the hospital after my first csection. It was handmade by a loving group of ladies for csection mommies to press against their tummies when they coughed, when they had to buckle their seat belts, etc. I love that thing and used it so much! It has retired to my daughters doll crib now.